128 Real English for life beyond the classroom English in the real world is constantly evolving, and learners need to move with it. But sometimes the English you can learn from your coursebook just isn't enough for real life. 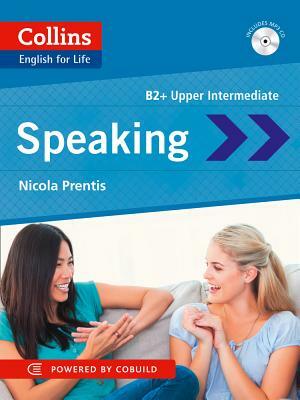 Using real everyday language, English for Life: Speaking (B2+) will help you to sound natural, clear and confident. > Hear the language people really use when they are speaking > CD with over 100 model conversations and practice exercises > Useful tips to increase your understanding of tone, slang and social context Includes practice of: * Dealing with difficult conversations * Expressing annoyance and anger * Showing sympathy * Convincing * Being tactful About the series: What is it? Collins' innovative English for Life series adds the extra bit of authenticity to your studies that traditional coursebooks often lack. The series includes helpful up-to-date and relevant topics needed to get by in English and uses authentic material from the Collins Corpus, the world's largest database of the English language. How can the series be used?